He had a dream. And he fought all his life to fulfill it. On Aug 28, 1963, Martin Luther King organized a massive march on Washington, DC, and on the steps of the Lincoln Memorial, delivered one of his most famous speeches, the like of which have seldom been heard from any leader in the world ever. This is the highly inspiring "I Have a Dream" speech". Read it. To let your friends have the pleasure, click here to refer this page to them. Have a great Martin Luther King Day! 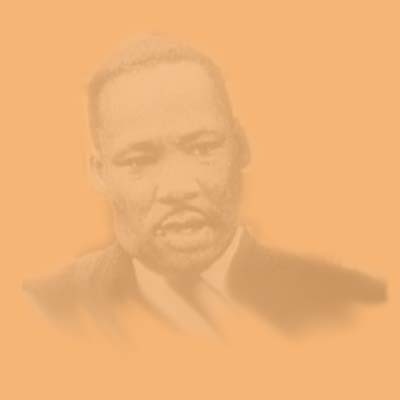 The �I Have a Dream� Speech In 1950's America, the equality of man envisioned by the Declaration of Independence was far from a reality. People of color, were discriminated against in many ways, Martin Luther King, Jr., a Baptist minister, was a driving force in the push for racial equality in the 1950's and the 1960's. In 1963, King and his staff focused on Birmingham, Alabama. Thrust into the national spotlight in Birmingham, where he was arrested and jailed, Dr. King organized a massive march on Washington, DC, on August 28, 1963. And when this happens, when we let freedom ring, when we let it ring from every tenement and every hamlet, from every state and every city, we will be able to speed up that day when all of God's children, black men and white men, Jews and Gentiles, Protestants and Catholics, will be able to join hands and sing in the words of the old spiritual, 'Free at last, free at last. Thank God Almighty, we are free at last.' "